Below you will find a useful recipe for an extremely versatile multi-purpose Sulfate-Free Foaming Liquid Soap. Use this formula as a foaming facial cleanser, foaming hand soap, foaming body wash or even a foaming dish soap. When diluting our PureEssence base for use in a foaming dispenser, you must mix poly 20 into the water to achieve a transparent product. Mixing preservative alone into the water will result in a cloudy finished product. Use the recipe tested below to create a transparent product. Since the Pure Essence already has a slight yellow tinge, the final product will have a very slight yellow color. This may increase if the fragrance oil or essential oil you are using is dark to begin with. We recommend making a small test batch with your fragrance to be sure you are satisfied with the color, or you can always add colorant to achieve your desired color. Mix the polysorbate 20 with the preservative before adding it to your DI water. Add the combined preservative mixture into the water and mix thoroughly. Bubbles will form on the surface. You can either let the bubbles recede on their own or lightly spritz with alcohol to eliminate them immediately. Mix the fragrance into the PureEssence and stir thoroughly. Don’t be alarmed if the base thins out. It doesn’t affect the foaming qualities of the finished product. Finally, add the scented base into your water mixture and incorporate until transparent. If done in a gallon, you can shake the gallon vigorously. The foam will vary depending on which foam dispenser you use. Some foam dispensers will give a light airy foam while others give a rich thick lather. Always test the product in your bottles before making a big batch. Test your fragrance with this recipe to make sure that it doesn’t make the product cloudy. If your fragrance turns the product cloudy but you like the way it smells and works, simply put it into an opaque bottle. Remember, our PureEssence base is a mild multi functioning wash. 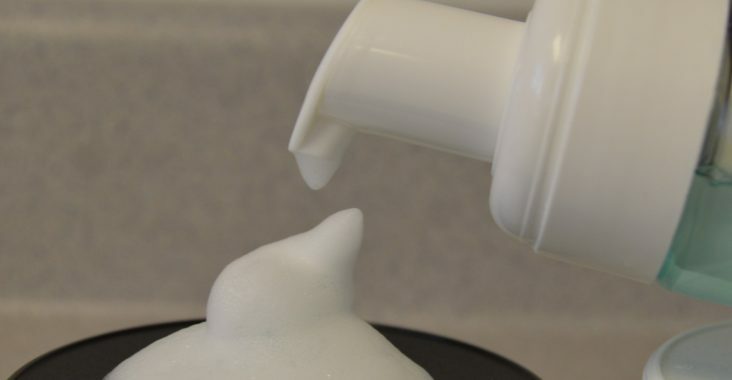 There are many uses for a foaming liquid soap. As long as you have a foam dispensing bottle, the sky is the limit.